Rollin Fabrications offer a wide range of structural steel work, such as staircases, fire escapes, balconies, security fencing and more. They operate in Nottingham, Sheffield, Derby, Lincoln and the surrounding areas. 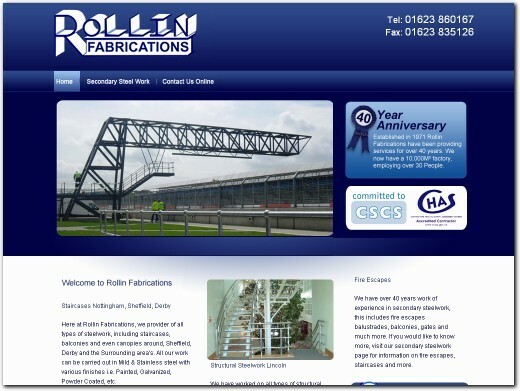 Rollin Fabrications have over 40 years of experience and can cater their designs to the customer's specific requirements. UK (Newark Nottinghamshire) based company - established in 1971 - providing steel fabrication services. Website includes details of services provided, work examples, client list, details of business premises, accreditations, full company contact details including company registration number.